This entry was posted in Reading, Uncategorized and tagged Colin Firth, Eric Lomax, Far East POWs, Guantanamo Bay, Hiroyuki Sanada, Jeremy Irvine, literature, Nicole Kidman, non-fiction, Researching FEPOW History, Thailand-Burma railway, The Railway Man, WWII by hilarycustancegreen. Bookmark the permalink. Deep reflection on Guantanamo Bay, and how POW were treated when they came back to “civilian life”.Everyone wanted to forget about the war. I know of the story of a French-Canadian He was taken prisoner in Hong Kong in December 1941. His name is Patrick Poirier who was with the Royal Rifles of Canada. This is sadly and understandably often the case. Forgiveness is rare and demands a long journey with help from friends. I think the rest of us can contribute by listening to the stories of people who have suffered even if we fail to help them back to forgiveness. Pat Poirier was my great uncle and the stories were mind boggling. I’m not sure anyone should be required to forgive such atrocities. Still, he was a very kind and gentle man despite the horrors he endured. That to me is a win in any case. As is so often the case, the book is better than the film. Still, it is a good thing that such a serious film is made with renowned actors so as to bring attention to these inhumane tortures. And posts like this one add to the attention. Thanks for posting. Precisely. I hope many people see it. It is uplifting and there are moments of humour. Even without having read the book, we felt the film wasn’t as satisfying as we expected. Nicole seemed wooden and the emotional tugging of our heartstrings was a bit too obvious. The younger Eric Lomax working away at making the radio in that dreadful camp didn’t look hungry or gaunt enough compared with all the others. The best part was the end when the two became friends and the photos of the real men were shown. The ‘Book thief’, also a movie (and book) about war and terror was a better one, we felt. The Guantanamo Bay torture camp is indeed on par with the worst of what happens when revenge is the only motive in seeking justice. By the way, our own Australian Government is doing the same. Total secrecy in now engaging the Navy and Army towing back boats of refugees from Australian waters back to Indonesia. They are thumping their nose at the UNHCR and Human Rights bodies. A depressing continuation of inflicting terror. ‘When will they ever learn? Thank you Hillary for your efforts in bringing to our attention all the injustices that have happened and still are happening. We rather liked Nicole’s understated performance (but then we’re English). 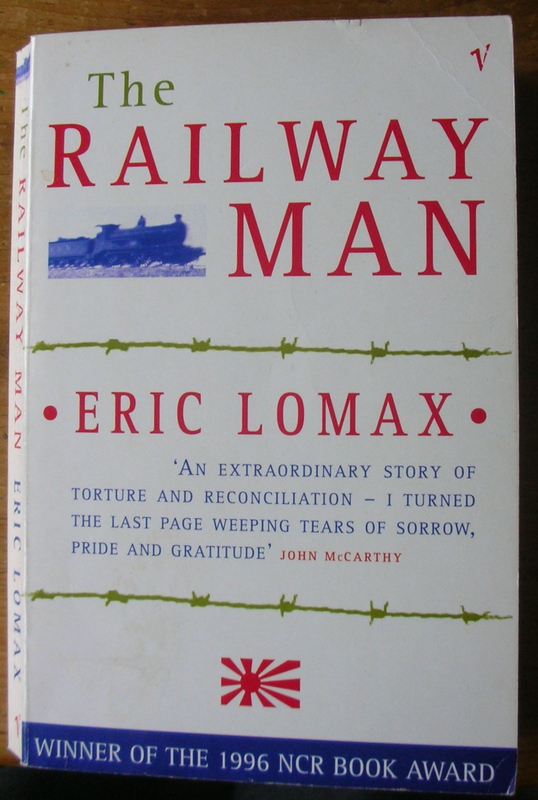 I agree that the younger Lomax looked over-fit, though re-reading the book I realise that Lomax never worked on the railway or, more crucially, went up-river to the jungle camps. He works in the engineering depots with better guards and food. Later after his beating and torture he was starved very nearly to death and suffered appalling diseases in gaol. We will go and see The Book Thief. Thanks for the recommendation. I have not seen either of these films advertised in HK but maybe they will show soon. I regret that I find such films hard to see and would rather read the book. Guantanamo is a disgrace which will blight the USA for a long time. I hope Australia sees the error of its ways soon and does not condemn itself in the eyes of the world. I also find such things hard to watch. I am so pleased for the memory of those men that, according to The Guardian weekly chart, 12,000 copies of the book The Railway Man sold last week, making it top of the non-fiction list. I also hope maybe one or two people in power will be influenced by the content.